Perched mainly atop limestone cliffs overlooking Balangan Beach, the championship Bali Golf course at New Kuta Golf Course offers long, broad vistas of the Indian Ocean and a pair of holes that play directly along the shore. The Bali golf course is the centerpiece of a resort development that will eventually boast hotels, villas, restaurants and shops. Ayana Resort & spa and Four Seasons Jimbaran Bay are already nearby; both have arrangements for guests to play New Kuta, site of the 2009 Indonesian Open. New Kuta Golf is the newest golf course in Bali and located very close to the Ngurah Rai airport about 25 minutes drive is downstream journey to the tourist attraction that is very famous of Uluwatu. By having 18 holes designed by famous designer makes this place very convenient and satisfying for golfers of all skill levels. With the view directly overlooking the Indian Ocean make this place more exotic and interesting to visit. The par-72, 6,812-yard layout has a links feel with native grasses, vegetation and just a handful of trees bordering its seashore paspalum fairways, tees and roughs. The greens are planted with smooth-rolling ultra dwarf bermudagrass, perfect for Bali's golf friendly climate. 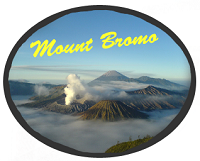 Mount Bromo or Gunung Bromo is the most visited tourist attractions in East Java. Komodo dragon is a large species of lizard found in the Indonesian islands.